Fashion blogger Susie Bubble will be dressing the windows on the day, to reflect current catwalk trends but using second-hand Designer Jumble fashion. Designer Katie Jones, who was showcased at London Fashion Week in Feb (we wrote about her in our coverage), will be in store upcycling a vintage Jean Paul Gaultier jumpsuit in her inimitable quirky style, and taking bookings for personal workshops. Graffiti artists Pen Pushers will be creating a special “Fashion Revolution” artwork installation live before your eyes. AND last but not least, we will be there with Sew It Forward, our frock-friendly initiative that encourages people to share their sewing, knitting and mending skills. Bring a garment in need of some TLC and find out how to keep it looking good for longer! If that isn't enough, you can also come see a celebrity gallery of photos by Trevor Leighton and styled by Alice Wilby, each wearing their clothes #insideout for Fashion Revolution Day, including Mary Portas & Melanie Rickey, LibertyLondonGirl, Caryn Franklin, Livia Firth and Bianca Jagger. On the day Designer Jumble will also unveil a collection of 1000 designer pieces from the wardrobe of Hannalore Smart, widow of Circus King Billy Smart Jr, who has collected iconic items by Westwood, Alaia, YSL, Chanel, Dior and more from the last three decades, including a rare Issey Miyake moulded corset, considered one of his most iconic designs. Not to be missed! Events will run between 10am-6pm, entry and attendance is free. Closed from 6pm for a private event. 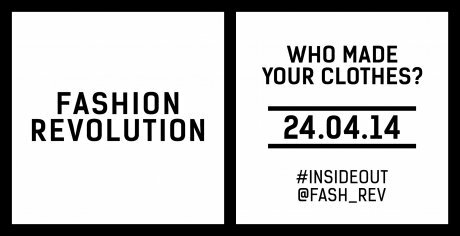 There are 51 countries taking part in Fashion Revolution Day, so even if you don't live in the neighbourhood it's likely there is something exciting, inspiring and thought-provoking happening not too far away. You can find a list of the global events in the 'What's happening near you' section of the Fashion Revolution Day website:www.fashionrevolution.org/get-involved/countries. Follow the team on Twitter @Fash_Rev. 1. Can’t make along? Then why not share skills with friends, family or colleagues on the 24th as way to mark Fashion Revolution Day. If you can’t sew, find someone who can and offer to swap skills – teach them how to cook your favourite meal in return for them showing you how to mend! 2. Download the Sew It Forward voucher from our website and give it to someone with the promise of passing on your skills. Pledge to share your skills and when you do, please tell us about it, take a photo and share it with us on Twitter or Instagram. 3. Follow us on twitter and Instagram – on Fashion Revolution Day we’ll be answering simple mending questions from our base at Designer Jumble. 4. Can’t get in touch on the day? Join The Good Wardrobe community – it’s free, only takes a few seconds and will allow you to start sharing your knowledge and skills by posting on the forum. You can for ask advice from others and offer your own top tips. 5. The brilliant stylist Alice Wilby who worked with photographer Trevor Leighton and a whole host of celebs on the Fashion Revolution Day shoot, will be on Twitter and Instagram throughout the day. So do get in touch with all your eco fashion style dilemmas.